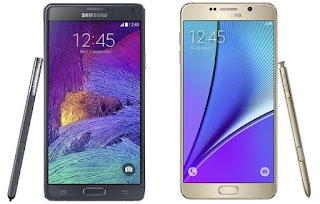 The Galaxy Note 5 just got unveiled at the Samsung Unpacked 2015. And like every new Galaxy flagship device, it builds upon the features present in those devices before it. It many ways the Galaxy Note 5 is better than last year's Galaxy Note 4, but are the somewhat marginal differences between the two devices compelling enough to warrant an upgrade. Hopefully the table below might help you decide. The Galaxy Note 5 has the Note 4 beat in the camera department, however if the camera optics is the same one in the Galaxy S6, then the differences in the photo quality between the two devices is almost insignificant. The processors and dynamic memory have also been given a boost, the Exynos 7420 processors have a clear advantage over the Snapdragon processors in the Note 4 due to the 14nm fabrication used, which in turn delivers better performance and energy saving. In some ways, the Galaxy Note 5 is a backward step from the Galaxy Note 4, as it drops some fan favourite features such as the microSD slot and a non-removable battery which offers less capacity when compared to that of the Galaxy Note 4.